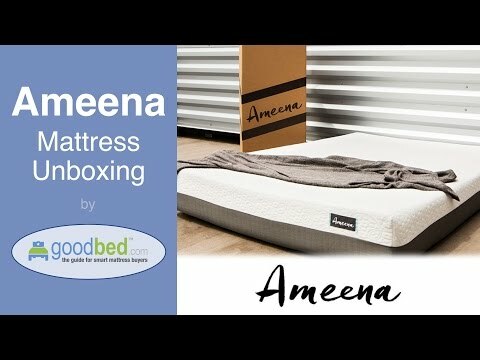 GoodBed's unboxing and set-up of the Ameena gel memory foam mattress from US-Mattress. A detailed explanation of the interior components of the Ameena mattress. We expertly selected the optimal materials and constructed them in the ideal combination to ensure a superb value. But sleeping well means more that just having the best mattress, it also means being able to rest knowing you've done your part to make the world a better place. 2" PREMIUM ENERGEX FOAM. Our top layer provides a quick bounce-back, responsive feel keeping you from sinking too far and ensuring you're fully supported when you move in bed without the slow recovery of other foam. 2" PREMIUM GEL MEMORY. Our middle layer conforms to your body, reducing the pressure points around your shoulders and hips, lessening your body's need to toss or turn and thereby promoting deeper sleep. The conforming property also helps ensure proper spinal alignment for comfortable sleep. The Premium Gel Memory Foam (vs. regular memory foam) also draws away excess heat, helping you to sleep cooler. 6" BREATHABLE BASE FOAM. Durable for solid support, yet breathable to help you sleep cooler, the base layer works in conjunction with the premium layers above to enhance the support and cooling properties of the entire mattress. We'll donate a mattress for every Ameena bed purchased. The donation bed is a quality American made model that will provide clean, restful sleep to those in need. Improve your sleep and someone else's. Is Ameena the right bed for you? Ameena mattresses are recommended by 100% of owners on GoodBed (based on 2 ratings). Do you have something to say about your Ameena mattress? Write a Review! There are 2 ratings on GoodBed for Ameena, but no reviews yet. Be the first. Note: The product line specifications above were derived from the active Ameena models listed on GoodBed. As a result, these details may not be comprehensive and may not apply to all Ameena models. If you are seeking specifications for a particular Ameena mattress, please search for that mattress by name on GoodBed, or check with your local Ameena dealer. Ameena is a mattress manufacturer founded in 2016 that is based in Brighton, MI in the United States. Have an update or correction to our information about Ameena? If so, please take a moment to suggest an edit. Ameena mattresses sold by Ameena come with a 120-night in-home trial. Upon returning mattress (typically by donating to a local charity), customer receives full refund + $100 gift certificate to US-Mattress.com. No return or exchange fees.